Schleswig-Holstein is the northernmost of the sixteen states of Germany, comprising most of the historical duchy of Holstein and the southern part of the former Duchy of Schleswig. Its capital city is Kiel; other notable cities are Lübeck, Flensburg and Neumünster. Schleswig-Holstein borders Denmark (Region Syddanmark) to the north, the North Sea to the west, the Baltic Sea to the east, and the German states of Lower Saxony, Hamburg, and Mecklenburg-Vorpommern to the south. The former English name was Sleswick-Holsatia, the Danish name is Slesvig-Holsten, the Low German name is Sleswig-Holsteen, the Dutch name is Sleeswijk-Holstein and the North Frisian name is Slaswik-Holstiinj. Historically, the name can also refer to a larger region, containing both present-day Schleswig-Holstein and the former South Jutland County (Northern Schleswig) in Denmark. Schleswig-Holstein lies on the base of Jutland Peninsula between the North Sea and the Baltic Sea. Strictly speaking, "Schleswig" refers to the German Southern Schleswig, whereas Northern Schleswig is in Denmark. 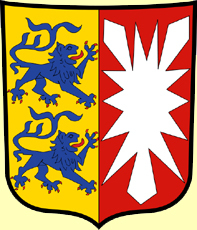 The state of Schleswig-Holstein further consists of Holstein as well as Lauenburg, and the formerly independent city of Lübeck. In the western part of the state, there are lowlands with virtually no hills. The North Frisian Islands, as well as almost all of Schleswig-Holstein's North Sea coast, form the Schleswig-Holstein Wadden Sea National Park (Nationalpark Schleswig-Holsteinisches Wattenmeer) which is the largest national park in Central Europe. Germany's only high-sea island, Heligoland, is situated in the North Sea. The Baltic Sea coast in the east of Schleswig-Holstein is marked by bays, fjords and cliff lines. There are rolling hills (the highest elevation is the Bungsberg at 168 metres or 551 ft) and many lakes, especially in the eastern part of Holstein, called the Holsteinische Schweiz ("Holsatian Switzerland") and the former Duchy of Lauenburg (Herzogtum Lauenburg). Fehmarn is the only island off the eastern coast. The longest river besides the Elbe is the Eider; the most important waterway is the Kiel Canal which connects the North Sea and Baltic Sea. German is the official language, Low German, Danish and North Frisian enjoy legal protection or state promotion. Sylt is an island in northern Germany, part of Nordfriesland district, Schleswig-Holstein and well known for the distinctive shape of its shoreline. It belongs to the North Frisian Islands and is the largest island in North Frisia. The northernmost island of Germany, it is known for its tourist resorts, notably Westerland, Kampen and Wenningstedt-Braderup, as well as for its 40 km long sandy beach. It is frequently covered by the media in connection with its exposed situation in the North Sea and its ongoing loss of land during storm tides. Since 1927 Sylt has been connected to the mainland by the Hindenburgdamm causeway. 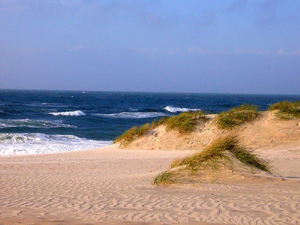 Sylt is a unique part of Germany, since it is part of the Frisian Islands. It has its own dialect, Söl'ring, which is the indigenous speech of Sylt. Söl'ring is a unique dialect of insular North Frisian, with elements of Danish, Dutch and English. Today, only a small fraction of the population still speaks Söl'ring. A law to promote the language („Friesisch-Gesetz“) was passed in 2004. The northernmost part of the island, Listland, was traditionally Danish-speaking. As in many areas in Schleswig-Holstein on New Year's Eve, groups of children go masked from house to house, reciting poems. This is known as "Rummelpottlaufen", and as a reward, children receive sweets and/or money. 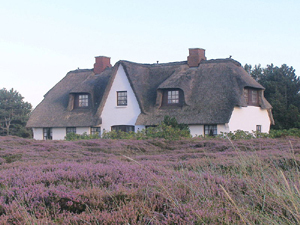 Sylt also has unique Frisian-style houses. Kiel is the capital and most populous city in the northern German state of Schleswig-Holstein, with a population of over 237,000 (2009). Kiel is approximately 90 kilometres (56 mi) north of Hamburg. Due to its geographic location in the north of Germany, the southeast of the Jutland peninsula, and the southwestern shore of the Baltic Sea, Kiel has become one of the major maritime centers of Germany. For instance, the city is known for a variety of international sailing events, including the annual Kiel Week, which is the biggest sailing event in the world. The Olympic sailing competitions of the 1936 and the 1972 Summer Olympics were held in Kiel. Kiel has also been one of the traditional homes of the German Navy's Baltic fleet, and continues to be a major high-tech shipbuilding centre. Located in Kiel is the Leibniz Institute of Marine Sciences at the University of Kiel Kiel is an important sea transport hub, thanks to its location at the Kiel Fjord (Kieler Förde) and the busiest artificial waterway in the world, Kiel Canal (Nord-Ostsee-Kanal). 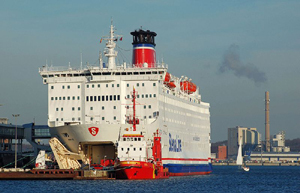 A number of passenger ferries to Sweden, Norway and other countries operate from here. Moreover, today Kiel harbor is an important port of call for cruise ships touring the Baltic Sea. Lübeck-The Hanseatic City of Lübeckis the second-largest city in Schleswig-Holstein, in northern Germany, and one of the major ports of Germany. It was for several centuries the "capital" of the Hanseatic League ("Queen of the Hanse") and because of its Brick Gothic architectural heritage is on UNESCO's list of World Heritage Sites. In 2005 it had a population of 213,983. 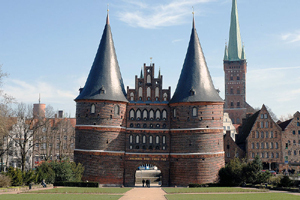 Situated at the Trave River, Lübeck is the largest German port on the Baltic Sea. The old part of the town is an island enclosed by the Trave. The Elbe-Lübeck Canal connects the Trave with the Elbe River. Another important river near the town centre is the Wakenitz. Autobahn 1 connects Lübeck with Hamburg and Denmark (Vogelfluglinie). The borough Travemünde is a sea resort and ferry port at the coast of the Baltic Sea. Its central station links Lübeck with a number of lines, notably the line to Hamburg. During World War II, Lübeck was the first German city to be attacked in substantial numbers by the Royal Air Force. The attack on 28 March 1942 created a firestorm, that caused severe damage to the historic centre and the Bombing of Lübeck in World War II destroyed three of the main churches and greater parts of the built-up area. A POW camp for officers, Oflag X-C, was located near the city from 1940 until April 1945. Lübeck was occupied without resistance by the British Second Army on 2 May 1945. On 3 May 1945, one of the biggest disasters in naval history happened in the Bay of Lübeck when RAF bombers sank three ships which, unknown to them, were packed with concentration-camp inmates. About 7,000 people were killed. Like many other places in Germany, Lübeck has a long tradition with Christmas market in December, which includes the famous handicrafts market inside the Heiligen-Geist-Hospital (Hospital of the Holy Spirit), located at the north end of Königstrasse. Flensburg is an independent town in the north of the German state Schleswig-Holstein. 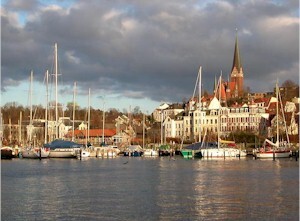 Flensburg is the centre of the region Southern Schleswig. After Kiel and Lübeck it is the third largest town in Schleswig-Holstein. In May 1945 Flensburg was the residence of the last government of Nazi Germany, the so-called Flensburg government led by Grand Admiral Karl Dönitz, which was in power from 1 May (Hitler's death) until its dissolution on 23 May. The nearest larger towns are Kiel (86 km south) and Odense in Denmark (92 km northeast). Flensburg's city centre lies about 7 km from the Danish border. The Danish minority in Flensburg and the surrounding towns run their own schools, libraries and Lutheran churches from which the German majority is not excluded. The co-existence of these two groups is considered a sound and healthy symbiosis. In Denmark, Flensburg seems to be mainly associated with its duty-free shops where, amongst other things, spirits, beer and candy can be purchased at cheaper prices than in Denmark. Currently the duty free shops are able to sell canned beer to Scandinavians without paying deposits as long as the beverage is not consumed in Germany. However, owing to the vagaries of the money markets, the bargains are not as great as they once were.